At Liki Tiki we encourage our guests to indulge themselves in any of our plentiful amenities. 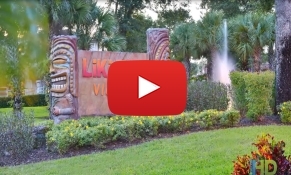 Liki Tiki Village Focuses on Creating a Relaxed Family Atmosphere for your next Orlando Vacation. Our Orlando vacation condos located near Disney are the perfect place for a relaxed family vacation in the Florida sun. Refresh yourselves in one of our 2 expansive, heated pools or Liki Tiki Lagoon, a 1.5 acre, 220,000 gallon, water playscape that combines the atmosphere of a resort swimming pool and the excitement of a water activity park. The lagoon features 5 water slides, an erupting water volcano, a waterfall, a toddler's area, and spouting tiki heads. Enjoy your favorite read while the children play pirates, mermaids, or whatever their imaginations conceive. Around the lagoon are lounging areas and a children's playground. For a treat or full meal, experience Shipwreck Sally's Bar and Grill. Our resort condos also feature The Harbor (*closed toe shoes are required for paddleboat and surrey bike use ), where you can play a round of tropical mini golf or shuffleboard, then cruise the lake in a paddle boat making the most of your Orlando vacation. Monday through Friday, Liki Tiki Village provides a full agenda of arts and crafts fun for the children. For Liki Tiki Village Activities check-out our event calendar. Exercise equipment is available in our indoor, air-conditioned, fitness center. For outdoor exercise, our basketball and tennis courts afford the opportunity for high-energy workouts and fun. Equipment is available at no cost. After a busy day at Walt Disney World®, Universal Orlando® Resort or SeaWorld Orlando® theme parks, luxuriate in the hot tub, swim laps, or while away the rest of the day reading or sipping a cool drink on the patio or balcony. Order a pizza at Shipwreck Sally’s , and then meet at the picnic area to review the day and make a plan for tomorrow. With so many attractions so close to Liki Tiki Village, choosing what to do next can be an exciting challenge. Grocery stores, Wal-Mart, Target, and pharmacies are conveniently located only moments away from the resort. Being located on U.S. 192, our Orlando vacation condos provide the opportunity to make day trips to the Atlantic beaches on the east coast and the Gulf beaches on the west coast. It is a short drive to Kennedy Space Center to strap yourself in for the Shuttle Launch Experience or to Fantasy of Flight to fly a Stearman bi-plane or ride in a hot air balloon. Lakes are plentiful in Central Florida, so water sports, fishing, and boating are within easy reach. Liki Tiki Village features luxurious Orlando vacation condos near Disney that have all your family needs for a relaxing stay. Pleasurable dining can be found in your own condo, at Shipwreck Sally's poolside bar & grill, or any of the many dinner shows and restaurants in the Central Florida attraction corridor. Family entertainment abounds in the magical Orlando area. It's your Orlando, Florida vacation, your weekend getaway, your reconnect time with your family at Liki Tiki Village. Liki Tiki Village is a condominium style property, daily housekeeping is not included. Should you desire housekeeping services during your stay, they are available for a nominal fee and may be arranged with our resort staff upon your arrival. *May be nominal charge associated with some events or activities.